Over the past 21 years, Sundance Media Group has published 30 books on topics ranging from UAS to post production, to Production and Cinematography. We invite you to check out our current lineup of books, with links to where you may purchase them. Risks and incidents increase dramatically at night due to lack of depth perception and other factors. Statistically and empirically, these risks can be mitigated with proper training. Those that are unable to make it out to one of our night-flight training sessions will appreciate the complexities of night flight. Last but not least, this book also demonstrates what to write and more importantly, what not to write when applying for a 107.29 waiver. At only 70 pages, this book is an easy read, with many illustrations and direct information. Click the cover to the left to preview this book on Amazon.com. Real estate photography is blowing up all across the Americas and along with it come UAS to provide better views of those million-dollar (and not so expensive) homes and commercial businesses. 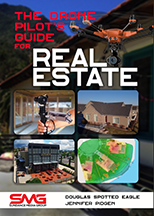 This publication defines equipment requirements, best practices, flight techniques, creating the best scenario, managing the local neighbors and authorities, while providing checklists for the UAS Pilot working in the Commercial or Residential real-estate industries. As the construction industry begins to realize the value of UAS, construction company owners, stakeholders, supervisors, and managers are looking for solid information that explains UAS as a practical, time/money-saving tool on the jobsite that isn’t filled with regulatory legal terms. While this publication does cover those regulatory conversations, they’re easy to comprehend and understand. 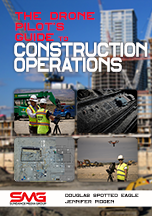 The book discusses uses related to job-site shrink, UAS for rapid calculation of volumetrics/stock piles, As-Designed/As-built scenarios, pre-inspection overview, overwatch of the jobsite for best practices and operational flow, how to set up the UAS for automated, repetitive workflows, post-flight software applications, setting up the flight for best mapping, 3D rendering, AD/AB application, providing valuable information to shareholders, input into a BIM system/intelligent jobsite program, and much more. If you’re connected to the construction trade, you’ll want to be reading this book. Public Safety Organizations such as Police, Fire, EMS, Waste Management have been rapidly adopting UAS at a growth of over 600% in the past year! Accident Scene Reconstruction with UAS slims time by more than 90%, while overwatch and forensic capture take on new roles with UAS assisting in the process. In this book we detail specific case studies using UAS for Major Incident work, CSI/Forensic work, Fire use-cases for both active fire-fighting and post-fire evidence/forensic captures. 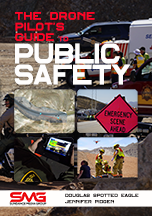 Details on operations for SWAT and other overwatch and surveillance techniques are presented in this book, including the use of powered tethering systems. Infrared systems for PSO are also demonstrated and discussed throughout the book. Virtually every topic is backed up with real-world case-study and demonstration of cost/time savings for any LE department. No longer in print, but soon to return, is the original Pilot’s Flight and Safety Manual. 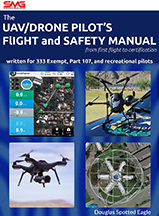 Covering basics such as 107 prep work, checklists, risk mitigation, best industry practices, choosing payloads, software, lighting, battery management, logging, and much much more, this is the definitive guide to learning to fly, being safe, perhaps creating a business, integrating UAS into a commercial workflow, and risk mitigation standards. This book also dives deeply into automated workflows and how to best plan battery life for automated mission areas, which software is most appropriate for specific types of 3d, photogrammetry, or print work, while speaking in laymans terms that are relatively easy to comprehend.